We have two to chose from depending on what kind of fishing you want & weather & tides - a 20 foot Seacraft or 18 foot Silverking. Both are comfortable & dry rides. Just depending on your targeting, I can accommodate. The type of fish depends on what time of the year, weather & tides. The Everglades produces many fish; Snook, Tarpon, Redfish, Snapper, Permit, Goliath Grouper & Trout. Everyday is a new day. No, you are covered under my Licenses & Insurance. What time does a charter start? We usually leave the dock about 7:30. Depending on weather & tides the time may vary. I am flexible. Full day is 8 hrs. 3/4 day is 6 hrs. Half day is 4 hrs. No. Whether you are a seasoned angler or a first time caster I am able to accommodate. Hat, sunscreen & polarized sunglasses. I will have rain jackets on board in case of in climate weather. I will have an ice chest set up with waters large enough to accommodate your food & drink. No cooler is necessary. I can set up box lunches, just let me know what you like! We will be fishing a very unique Ecosystem. 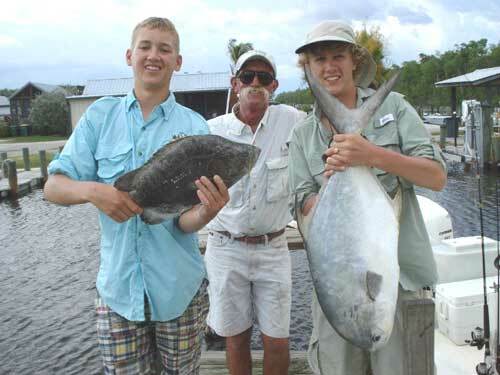 During our fishing you can expect to come across, Porpoise, Manatee, Turtles, Alligators and the largest variety of bird life in North America. Including the Great White Herons, Blue Herons, Pelicans, Egrets, Hawks and Eagles. We will be in the Heart of the Ten Thousand Islands & The Everglades National Park. With my knowledge & love of the area I will give you a full comprehensive trip on all aspects of this unique Ecosystem and catch fish. Bring your camera! What about fish we want to keep for dinner? I will clean and bag the fish you wish to keep, to take home or have one of local our restaurants cook it for you. Are there places to stay in Everglades City? There are hotels, motels, rental homes, condos and cabins available in Everglades City.